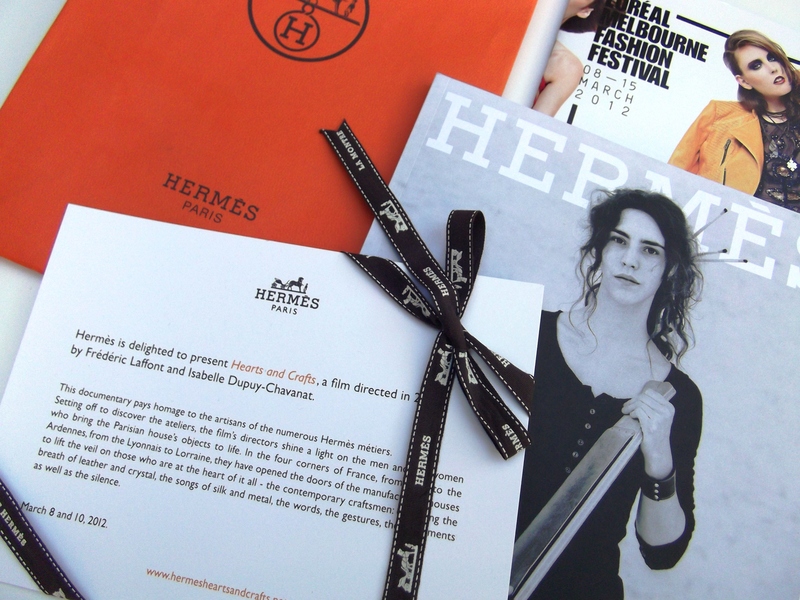 Hermès presented a screening of the film Hearts and Crafts as a part of the recent L’oreal Melbourne Fashion Festival, which is a really smart marketing move for the French mega luxury brand in Melbourne. Everyone knows that a decent sized Hermès Birkin bag will cost nothing less than the price of a small vehicle, and not every Australian will choose to go with a bag over a car. But if someone, even for a second, contemplates the Birkin bag, this is the kind of film that will go about turning him or her (most likely her) into an Hermes customer. The film goes behind the scenes into the many Hermès workshops in France to reveal the faces of their craftsmen who create their many iconic and sought after products. There’s so much beauty in the film; from the actual products such as the scarves, vases, handbags to the attentive way the craftsmen hammer, shine, polish or dye whatever materials they’re handling. In our age where fashion is more assembly line than artisan, it is exactly the high quality of work from these craftsmen as documented in the film that may justify the price tag and may win people over to become Hermès customers. For us, let’s just say we’re happy to walk away from the screening with the Hermès magazine (pictured below), but walking out of the Hermès boutique on Collins Street with a Birkin bag will have to wait. We just heard that the National Gallery of Victoria will be running additional screenings of the same film in April. Is this a case of popular demand, or a result of the Hermès boutique on Collins Street having an influx in foot traffic after the original screenings? We can only guess at the real reason, but if it didn’t work the first time, Hermès wouldn’t have brought on the encore screenings.